More-with-Less is one of my favorite cookbooks. 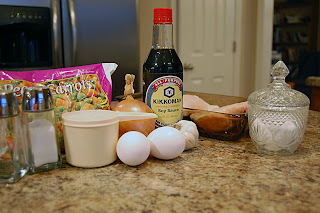 This recipe for Vietnam Fried Rice was a huge hit with my family. In a hot skillet add the oil and stir fry the meat if it’s not cooked. I sprinkled some soy sauce on the chicken before I stir fried it. Remove the meat from the skillet and add the garlic, onion, salt, pepper, sugar and soy sauce. I didn’t measure any of this, just eye-balled it. Stir fry until the onion is cooked through. Stir in the beaten eggs, stir frying until the eggs are done. They will not and should not look like scrambled eggs you eat for breakfast. Add the vegetables and stir fry until they are hot through. Add the chicken back in to the skillet, along with the rice. Throw in some more soy sauce until it looks good to you. Pull out the chop sticks and enjoy! Tiffany that looks good. I can never get fried rice to turn out correctly. I am going to give yours a try. What does this Chinese fried rice have to do with Vietnam? Rob, I don’t know. I adapted the recipe from the More with Less Cookbook and that’s what it is called in there. I suspect the original recipe was written by a missionary living in Vietnam. That sounds great, we’ll give it a try! You’re sharing some fab recipes, thanks. 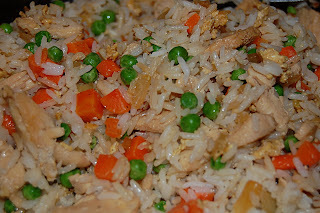 I love fried rice and this looks delicious! Thanks for stopping by my blog. Oooh, this looks good – I’ve never made fried rice before, but I think I’ll try this out SOON. Yum. Thanks! oh I am SO going to make this for dinner soon—your pictures make everythin look so yummy!! could you be a little more specific about how the eggs aren’t supposed to look like scrambled eggs when you add them to the skillet? what will they look like? Kimber, the eggs will look sort of stringy and just really mixed in with the other things. They won’t be yellow or fluffy looking like scrambled eggs. I hope you like it! Ohhh, that looks so super yummy! Yummy! Can’t wait to try this. Thanks for visiting my blog. I have recovered from my fall on ice. I appreciate your concern. I think Fried rice may be the foodstuff of the gods. I adore it and will HAVE to try your recipe. Look how that rice gleams! That looks so good it hurts! I want to eat it right now!!! I will have to put the stuff on my shopping list right now! Sounds yummy! I can’t wait to try it. Ooh, this sounds wonderful. I am definitely going to make this soon. are the amounts already doubled in the recipe or do I double them if I use two cups of rice? Laura, everything else in the recipe is the right amount. I just used twice the rice that I show in the picture. I made this last night for my family of six using 3 1/2 cups of rice and double the amounts of everything else in the recipe. I also added a small package of sliced mushrooms and a small can of sliced water chestnuts. It made a very large pan on food. It was so good, there is only one tiny serving left. Yummy! Can I share another fried rice recipe? In a wok or big fry pan- put 1 TBSP Veg oil. drop in the bacon pieces and cook until crispy- remove bacon save the fat- add a TBSP butter- dump in the rice. Saute until getting a little crispy- add soy to taste. keep frying. Meanwhile scramble and cook the eggs- dump into the rice- dump the bacon in and then the scallions- sprinkle with a little more soy- done. Jill, thanks for the recipe. That sound really good. My kids love bacon! I haven’t made fried rice for a long time so it’s long overdue. This will be the recipe I make next – Thanks! This is my favorite! I’ve made it twice in as many months. Our garden is in full swing. Of course, I have way too much zuchinni. I used just zuchinni instead of the frozen veggies in my last batch and it was outstanding! Another clever way to use that vegetable that never stops growing! this is one of our favorites from this site. we use asparagus stir fry bag from walmart, i also use the success bag of 10-minute brown rice to make it a little healthier, and instead of using oil, i just use non-stick spray. thanks for this recipe it rocks! i made this twice. the first time was with ham and leftover peas and carrots. tonight imade it with ground beef, and leftover peas and corn. this is delicious and makes a huge pan. thanks for sharing this !!! I make this rice with this sauce and it is SO good! Brooke, I’m going to have to try that sauce. I’ve wondered how Japanese steak houses make their fried rice sauce. It’s so good! Thanks for the recipe! Hey, I come from VN thanks for posting cause when my mom’s not at home, I don’t know what to eat. But now I’ve got this! Thanks again! I tried yours and it was delicious. I just want to say that this is one of our favorites, delicious! It’s also SO flexible! A great way to get rid of any leftover meats or veggies! If you are in a time crunch you can sub out the rice for a couple packs of ramen noodles! Thanks! Great idea about the ramen noodles! I’ll have to try that. We love this dish too. It’s one of our family staples. Hi! I live in Japan and gave your recipe a try. My Japanese husband said it was delicious. — for meat, try Spam. Surprisingly, many fried rice dishes in Japan use Spam as it adds a lot of flavor! — Use Thai rice — it’s drier and less sticky — which is perfect for stir fry dishes. Your recipe was a success. Thank you again! Thanks for the substitution ideas! Tiffany, Is the 2 cups of rice cooked rice or uncooked? Thanks a bunch. Look forward to trying this! You’ll cook 2 cups of dry rice, which will yield a nice potful of cooked rice. Looks good, I’m going to give it a try. Can you tell me who the author of the cookbook is, there are lots with the same or a similar title online. The author is Doris Janzen Longacre. Great cookbook! I am so gonna try this!!! It looks less expensive than the other recipes I have seen. Can I use brown rice instead? You can absolutely use brown rice!! Yes, you can! That’s a great idea to have some ready to defrost and enjoy on those hectic days!